Reusable, shipping and storing pallet containers have a 1 wide stacking rim for secure stacking. These inter-stackable, straight wall containers are designed to maximize storage space by cubing in trucks and on pallets. 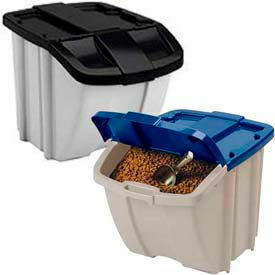 Ergonomically designed storage containers feature comfort grip handles on all four sides for quick and easy pick-up. Choose solid construction for small parts maintenance or mesh construction for content visibility. Containers sold in carton quantities. Click here to see full selections of our Plastic Pallets. Click here to see full selections of our Shipping & Storage Containers. High density polyethylene straight wall containers can be stacked under containers of various sizes. The straight-wall sides of these pallet containers securely and efficiently fit on standard sized pallets. 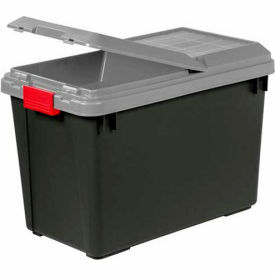 These wholesale storage containers have reinforced corners and a 150 lb. capacity to handle heavyweight items. Shipping containers have comfort grip handles for easy pick-up and handling. Efficiently transport goods or work in progress. Optional dolly base has a durable plastic frame with 4 swivel mold-on rubber casters. Measures 27-1/2"L x 18"W x 3"H with a 650 lb. capacity. Orbis StakPak Modular Straight Wall Containers Are Designed For Just-In-Time Applications Where The Same Containers Are Used For Shipping, Storage And Work-In-Process. Orbis StakPak Modular Straight Wall Containers are made of high density polyethylene for long lasting durability. StakPak System offers more than 20 straight-wall modular containers with advanced features to optimize reusable packaging system. Reinforced external ribbing adds maximum stacking strength and molden-in continuous bumper keeps dirt and dust from contaminating products. Drain holes in bumper and handles ensure easy cleaning and draining. Includes fingertip handles on adjacent sides for easy lifting. Available with smooth or reinforced bottom. Reinforced bottom ensures secure stacking of mixed container loads. Compatible with wide variety of AIAG pallets, top caps, and seat belt systems. Colors are Blue, Gray and Green. Package quantities are 3, 4, 6,8,12, 16 and 24. Capacities in cubic feet are 0.13, 0.32, 0.56, 0.62, 0.68, 0.72, 0.87, 1.09, 1.42, 1.78, 2.06, 2.2, 2.64 and 3.5. Available in a variety of outer and inner dimensions to meet job specifications. 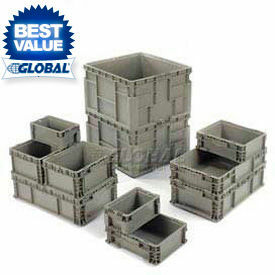 Euro-Fix Industrial Stackable Containers Are Designed For High Cube Utilization & Strength. Used for storage, distribution and work-in-process applications. Industrial containers can be inter-stacked on 32" x 48" Euro-pallets and 48" x 40" standard pallets. Made of high density polypropylene that is easy to clean. Suitable for food use. Resistant to most oils and acids. Withstands extreme temperatures. Reinforcing ribs for added strength. Built-in handles for easy lifting. Available in Solid or Mesh styles. Small Load Container (SLC) AIAG Stacking Containers Are Used For Various Commercial Or Industrial Transportation Applications. Small Load Container (SLC) AIAG Stacking Containers are made of heavy duty molded polypropylene for long lasting durability, strength and dependability. Stackable straight wall containers are designed and tested to AIAG RC-9 specification and compatible with standard AIAG 48 x 45 inch pallets. 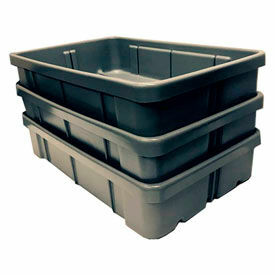 5, 7-1/2, 9-1/2 and 11 inch height containers are available in 15 and 24 inch lengths and 12, 15 and 22-1/2 inch widths. 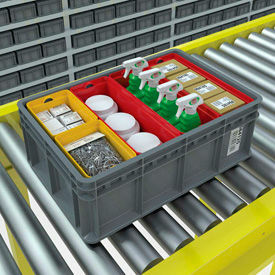 Akro-Mils® Stacking Multi-Load Totes Feature Straight Walls For Efficient Cubing On Pallets And ASRS Systems. Akro-Mils® Stacking Multi-Load Totes are designed to maximize space in Mini-Load Automated Storage and Retrieval Systems (ASRS) for long lasting use. Durable industrial grade polymer construction features reinforced bottom, ribbed side walls and a reinforced rim for added strength and stability. The unique sidewall clip design allows cups and dividers to attach quickly and securely to the tote, offering maximum flexibility to the user. Includes 1 year limited warranty. SSI-Schaefer FDA Approved Stacking Transport Containers Protect, Organize, Store And Transport Food, Packed Goods Or Loose Parts. SSI-Schaefer FDA Approved Stacking Transport Containers are made of FDA-approved high-density polypropylene impervious to most industry solvents and will not corrode or rot. Thick, uniform walls provide easy stacking. Appropriate for lean manufacturing. Available colors are Blue, Green Red and Yellow. Includes Label Holders. Dimensions vary per style. 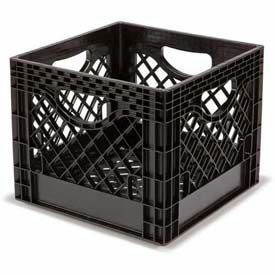 Dairy Milk Crates Are Designed For The Efficient Distribution Of Fluid Milk Products And Fruit Juice. 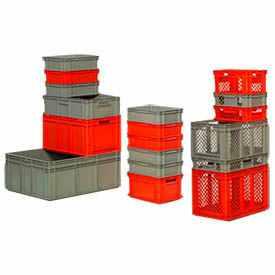 The milk crates are perfect to transport from dairy processing facilities to grocery stores, convenience stores and discount stores. 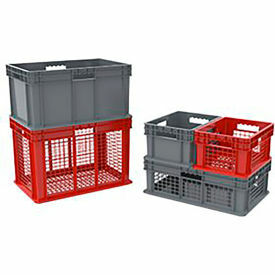 Available in the standard footprints mandated by the dairy industry, these crates offer exceptionally reinforced corners and bottoms. Designed for a long service life, the milk crates maintain their shape and performance through stacking, pressure washing and transportation. Molded Fiberglass Stackable, Polyester Fiberglass Storage Containers are Used for Parts Handling and Parts Transporting. These easy-to-clean, wear and weather resistant heavy duty fiberglass containers endure temperature extremes from -40° to +300°F. ideal for handling forgings, machined parts, stampings, ceramics, rubber and other hot parts from molds or processing machines. Storage containers are not affected by oils, grease, degreasing operations cutting oils. No sharp edges; wont damage delicate machined parts. 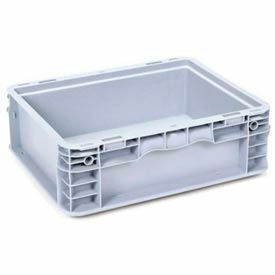 Tote boxes have optional tight seal white lids that secure contents that weigh up to 200 lbs. For mobility, just add a dolly to these shipping containers. 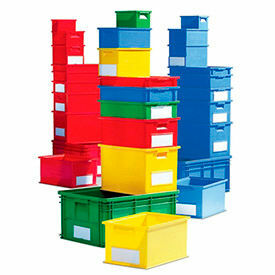 Long stacking plastic boxes are designed to transport and store long, bulky items. These storage containers have a durable polyethylene construction that resists chemicals and extreme temperatures. Smooth, straight interior walls provide maximum cube utilization and allow flexible dunnage and easy maintenance. 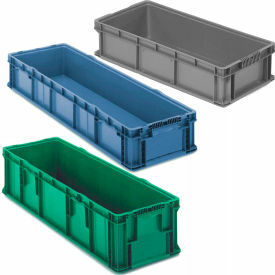 Long box rim with locking tab secures plastic containers. Ergonomic handles for comfort and safety. 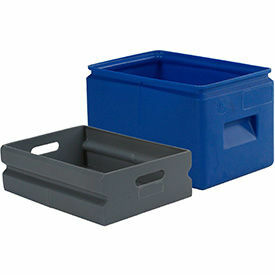 Durable vacuum-formed plastic tote boxes are designed for use with automated conveyor systems. Stability grooves on the bottom of these conveyor tote boxes provide an easy, even ride on conveyor belts (Model 239638 features a smooth, flat bottom). The extra wide external tote box lips minimize shingling and climbing during conveyor use. 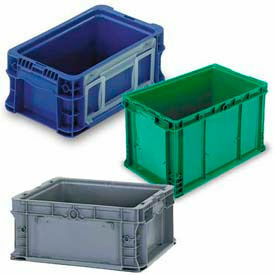 These storage containers have built-in anti-wedge lugs to prevent jamming (Models 239635 and 239639 do not include lugs). When unused, these plastic tote boxes nest to save storage space. Stacking Storage Containers w/Front Flap Cover Are Used For Indoor Or Outdoor Storage. 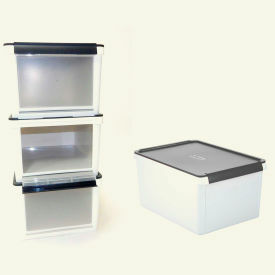 Stacking Storage Containers w/Front Flap Cover are made of weather resistant plastic for long lasting durability. Easy access front flap provides convenience. Used for recycling or dry storage. Stacks with or without lid. Front lid stays open when desired. Available colors are Black with Black Lid, Gray with Black Lid, Blue with Blue Lid, Gray w/Black Lid, White w/Gray Lid and Light Taupe with Blue Lid. Capacity is 18 gallons. Sold in package quantities of 1, 2, 3, 4, 6, 8 and 13. 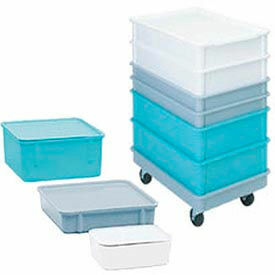 Large Storage Trunks Are Perfect For Organizing The Home, Wokshops Or Offices. Use these storage trunks in the garage, basement or attic to store seasonal decorations, sporting equipment, camping equipment or even gardening supplies. Two sturdy latches keep lid secure. Easily stackable for maximum storage. Some storage trucks include additional compartments on lids to keep contents separate and ready to organize. Available capacities are 15-gallon, 21.8-gallon, 23.1-gallon, 27-gallon and 34.5-gallon. Dimensions vary per model. All Access Organizer Containers Provide Easy Access And Organization For Closets. Toys, Crafts, Laundry, Offices, Garages, Dorms And More. All Access Organizer Containers are made of polyethylene or polypropylene to provide long lasting durability. Clear drop-down door provides visibility and access to contents even when stacked. Available color finishes are Black or Clear w/Black Lid. Dimensions vary per style. All-Purpose Storage Totes Provide Storage and Transport For Restaurants, Cleaning Services, Commercial Environments, and more. These all-purpose storage totes are designed to easily carry and handle beverages, condiments, plastic wares, and other items. The totes are made of polyethylene making them resistant to acids, chemicals, and other solvents. Available colors are black, blue, and gray. FDA approved.